After a win like the one that Wagner had last Saturday, the Seahawks could have flown all 2,600 miles to Cheney, WA without the help of a charter jet. There is no hotter team in America right now. Riding a nine-game win streak, which includes the NEC’s first-ever FCS playoff victory, Wagner will look to continue its storybook season at Big Sky member Eastern Washington on December 1. The ride started in Boca Raton where Wagner opened the season with a 7-3 setback to FBS member Florida Atlantic. The next two stops saw the Seahawks incur two more losses. A 13-10 setback at Georgetown dropped Wagner to 0-2, and, one week later, Outer Bridge rival Monmouth thumped the Seahawks in the NEC opener. At 0-3, however, Wagner did not put the bus in park. Instead, they kicked it into high gear. Starting with a convincing victory over Central Connecticut in the NEC-TV Featured Game of the Week on September 22, Wagner reeled off nine wins in a row for the first time since 1981. The team earned its first NCAA playoff berth since 1988 and posted its first postseason victory since the 1987 NCAA Division III National Championship Game. Doscher doesn’t doubt his team’s chances this week at Eastern Washington either. Sure, the Eagles hail from the mighty Big Sky Conference and have a number of players left over from their 2010 NCAA FCS National Championship Team, but the quarterback doesn’t sound intimidated in the slightest. One reason why Wagner has been able to “shock some people” this season has been the team’s propensity to take care of the football. Wagner is plus-11 in turnover margin for the season and has given the ball away a NEC-low six times. Doscher’s play is at the center of that stellar effort. The senior signal caller has not thrown an interception against a FCS team this season. His last interception came at Florida Atlantic in August! In fact, Wagner has committed only one turnover during its current nine-game surge. A third-quarter fumble by Doscher in a Week 11 matchup against Holy Cross is the lone giveaway Wagner has made since Week 3 against Monmouth. While Doscher makes plenty of plays, Wagner’s defense does its share as well. The Seahawks have “athletes at every level” of their defense according to Eastern Washington head coach Beau Baldwin. Four of those athletes earned all-NEC honors, including cornerbacks Jarrett Dieudonne and Torian Phillips. The latter, who started his collegiate career at Syracuse, was responsible for both interceptions of Colgate quarterback Gavin McCarney last week. Both Dieudonne and Phillips will have their hands full come Saturday at The Inferno, though. Eastern Washington’s passing attack averages 298.8 yards per game, 10th-most in FCS. Junior receiver Brandon Kaufman, who stands at 6-foot-5, is a two-time all-Big Sky first team selection who made 65 receptions for 1,270 yards and 10 touchdowns during the 2012 regular season. Despite the tall task that lies ahead, Wagner’s focus seems to be less on just how good Eastern Washington is and more internal. “Going into every game, we try not to think about other teams and what other people say,” said first team all-NEC running back Dominique Williams. In addition to playing for each other on Saturday, Williams and the Seahawks will play for a trip to the Elite 8. 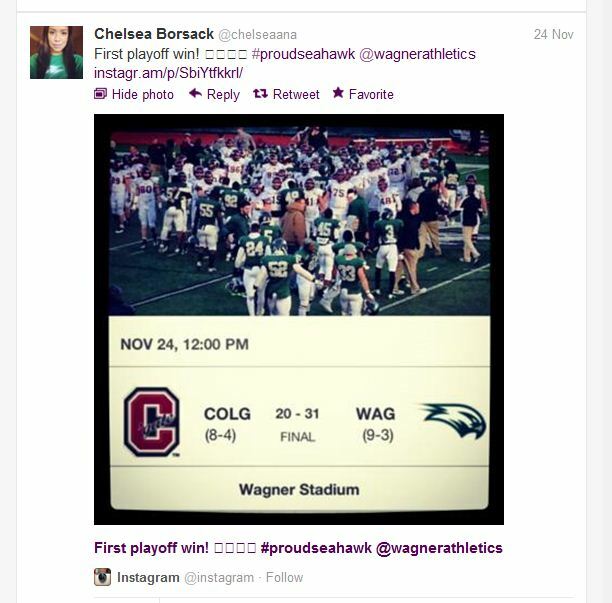 Yes, the 31-20 win over Colgate was Wagner’s first playoff victory at the Division I FCS level, and this fan certainly wasn’t the lone #ProudSeahawk on Grymes Hill this past Saturday. Rooting for his NEC brethren, this Central Connecticut defensive lineman clearly understands the meaning of #NECpride. The Wagner fans were out in full force on Saturday, accounting for a sellout crowd that ranks as the second-largest in the history of Hameline Field. There’s no question the Seahawks fed off the support. When it comes to Wagner’s defense, take your pick. Anyone on the unit could make a case for a Game Ball after a showing like the one they had against Colgate. If pressed to pick one individual, we’ll go with Mike Lombardo. The linebacker made a team-high 11 tackles, including 2.0 sacks of the Patriot League Offensive Player of the Year. He also forced a fumble. Looks like Molly is ready for a fun-filled day of hoops and free stuff at this year’s edition of Colonial Chaos. For those of you who will be in Moon Township and are interested in attending it runs from 10:00 am until 6:30 pm in John Jay Hall before picking back up from 8:00 pm until 10:00 pm in the Sewall Center on Friday, November 30. Ron may know what every NEC men’s player’s favorite color is, but he is, by no means, a women’s hoops guru. The good news is, one need not be a guru to recognize the fact that Tricia Fabbri’s Quinnipiac Bobcats and Joe Haigh’s Saint Francis Red Flash are playing good basketball of late. Their records speak for themselves. The Bobcats have yet to lose, having notched two wins over A-10 members and a season-opening triumph over 2012 WNIT Runner-up James Madison. The Flash have won four of their first five under a new head coach, including two wins over Mid-American foes and a victory over MEAC preseason favorite Howard. Paxton usually has his fingers on the pulse of Sacred Heart’s beat, and he was the first to send out this somewhat sad news. Yes, Mr. Cook is stepping aside to spend more time with his lovely children and grandchildren, but, yes, his departure leaves behind a huge void. The knowledgeable, humorous and wise Cook was one of the MAAC’s founding fathers during his time at Fairfield before coming to Sacred Heart and overseeing the Pioneers transition into the Division I ranks during the 1990s. Under his guidance, Sacred Heart has won the Brenda Weare NEC Commissioner’s Cup each of the past five years. This team manager was fired up for some more mayhem on Monday night at George Washington and what she got was another victory. The Mountaineers, whose fast and furious style of play has made way for the name “Mount Mayhem, have defeated an America East foe as well as the A-10 member Colonials. Not a bad start to the Jamion Christian Era. Kasey fired off this tweet shortly after North Carolina ended Fairleigh Dickinson’s College Cup run in overtime of their Sweet 16 matchup. Sure, the Knights came up short against the defending NCAA champions in Chapel Hill, but they have nothing to hang their heads about. Following a great regular season run, Seth Roland’s squad posted road wins over St. John’s and Saint Louis to reach the Sweet 16 for the second time in their head coach’s tenure. One month ago, millions across New Jersey, Staten Island and Long Island sat hopelessly in the dark. 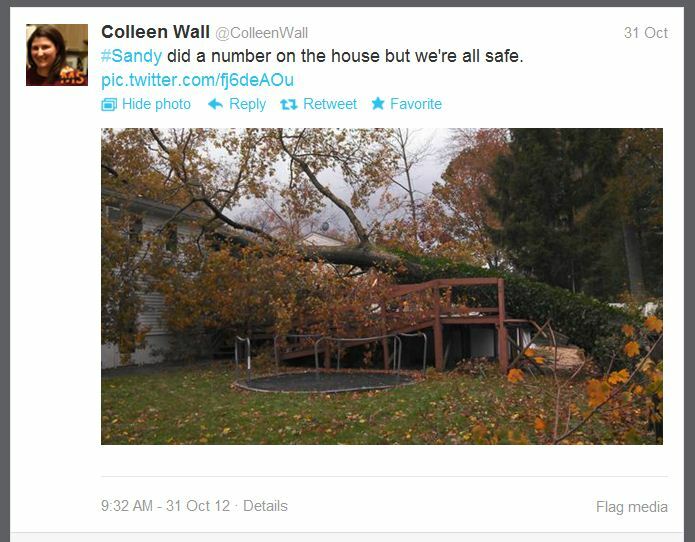 Superstorm Sandy had just torn through the area, leaving a path of destruction in its wake. Not only were power lines down, but whole homes had been washed away. Boats were thrown from marinas into folks’ front yards. Take the Monmouth football team for instance. Senior guard Mike Murphy is from Toms River and his grandparents live on the Barrier Islands. Tight end Evan Ruane was staying with his grandparents in Sea Bright, but was forced to evacuate. Then, there is wide receiver Neal Sterling, who grew up four blocks from the beach in Belmar. His house was unscathed, but he woke up to ply wood drifting down his street. Sportsnet New York (SNY) produced and aired a feature video on the three Monmouth gridders on November 9. 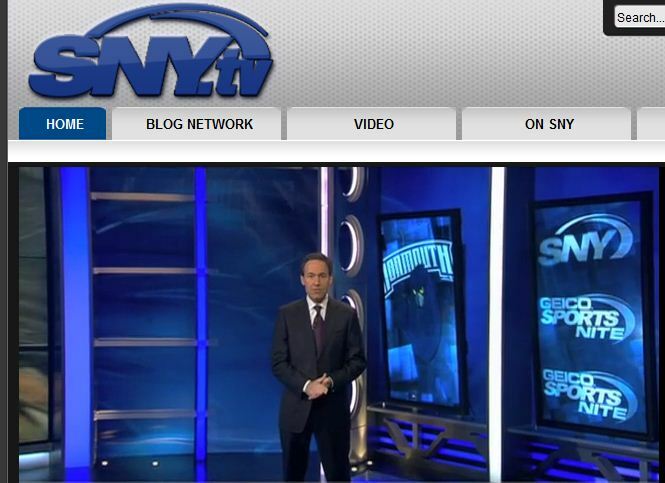 It can be viewed by clicking here or by visiting SNY.tv. 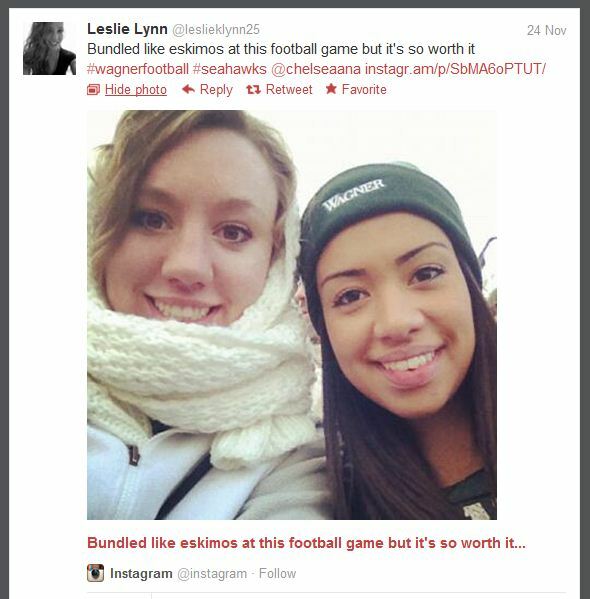 Needless to say, the effects of Superstorm Sandy forced the cancellation of Monmouth’s home game against Central Connecticut, which was set for November 3. It was the first time a Northeast Conference football contest was canceled since the Saturday after September 11, 2001. Monmouth did return to Kessler Field for game action on November 10, hosting Saint Francis (PA) in the NEC-TV Featured Game of the Week. In the SNY feature piece, Ruane noted how returning to his teammates on the gridiron helped him cope with the disaster. 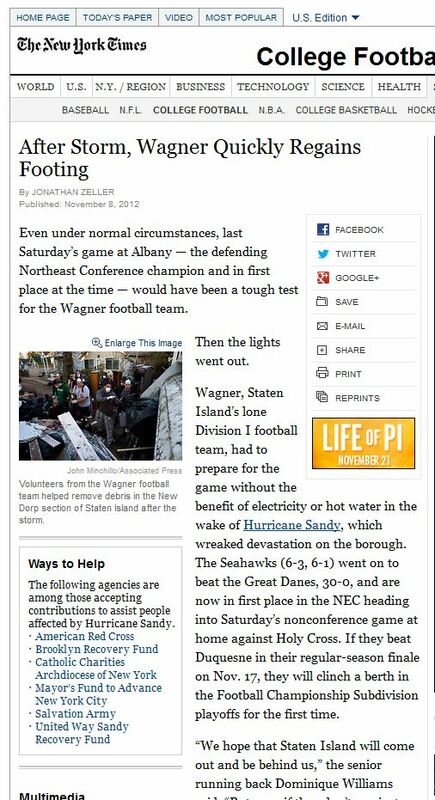 Wagner, which saw many of its Staten Island neighbors suffering in the aftermath, also used football to help cope. In addition to practice, conditioning and film study, the Seahawks made aiding relief efforts a team activity. 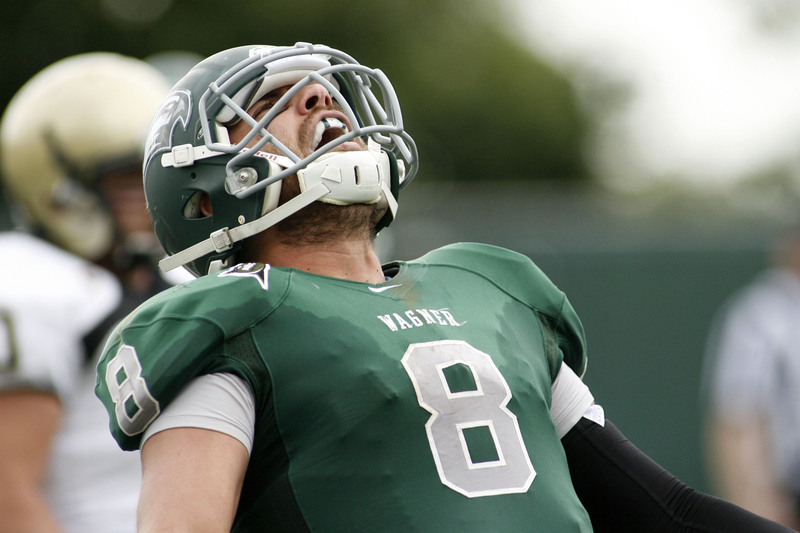 Amidst the chaos, Wagner played and won its most-meaningful football game in 25 years. The Seahawks went on the road and posted a 30-0 shutout of NEC preseason favorite Albany in a battle for first place on November 3. While the students who were directly affected by the superstorm embarked on the long recovery/rebuilding process, others from around the Northeast Conference participated in organized relief efforts. Eight of the Northeast Conference’s members took it upon themselves to spearhead programs aimed at helping those in need. Bryant – The Bryant Bookstore joined forces with the school’s Student Arts and Speakers Series (a student group) to sponsor a food and toiletry drive to benefit the Food Bank of Monmouth and Ocean Counties of New Jersey. 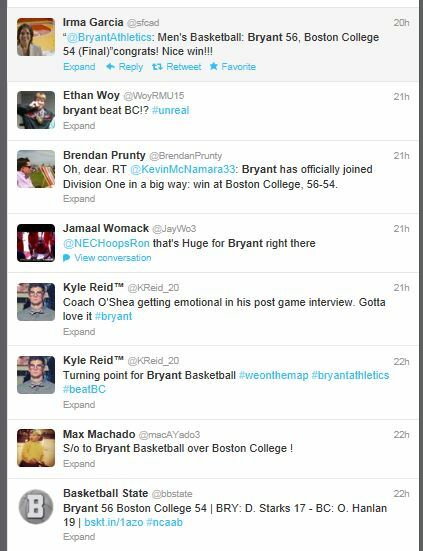 Read more about Bryant’s effort. Central Connecticut – The CCSU Fashion Club along with other organizations conducted a clothing drive on the New Britain campus on November 15. As the news post advertising the clothing drive stated, “Our brothers & sisters in New Jersey and New York need our help!! !” Read more of CCSU’s effort. In the days following the storm, the Monmouth University community came together to form “Hawks Fly Together for Relief,” an initiative aimed at “promoting a unified campus and a unified fundraising effort.” Read more on the initiative. Mount St. Mary’s — The Mount St. Mary’s Athletic Department donated all ticket revenue and proceeds from the men’s basketball home opener against Hartford, on Tuesday, November 13, to Catholic Charities USA for their hurricane relief efforts. The Mount also collected numerous donated goods at the game, including non-perishable foods, hygiene products and first aid items. Read more of the Mount’s effort. Quinnipiac – First-year Bobcats banded together and organized a clothing drive for the men’s basketball team’s home opener. Freshman Erica Miccoli was part of the group that collected clothes and donations to support those impacted by Hurricane Sandy. Read more of Quinnipiac’s effort. 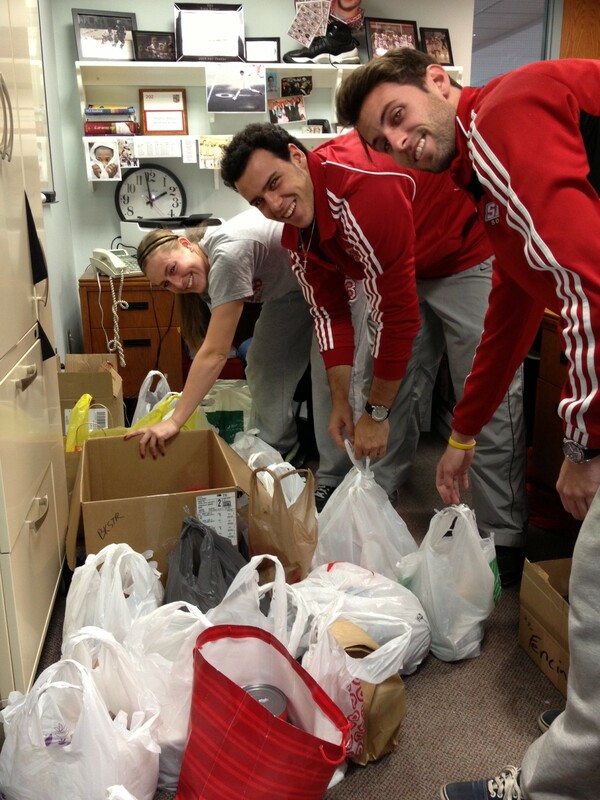 Sacred Heart – The SHU Student Athlete Advisory Committee (SAAC) in collaboration with Student Government sweaters, sweatpants, scarves, coats, gloves, hats, boots, and blankets to be donated to people affected by Hurricane Sandy. The Pioneers began the drive at their home volleyball match and football game on November 10 and continued it throughout the following week. Read more about SHU’s effort. St. Francis Brooklyn – Superstorm Sandy came and St. Francis Brooklyn responded by launching the Terriers for Terriers Relief Effort. TFT’s aim is to provide critical resources to those in the SFC family impacted by the horrific storm. Read more of SFBK’s effort. 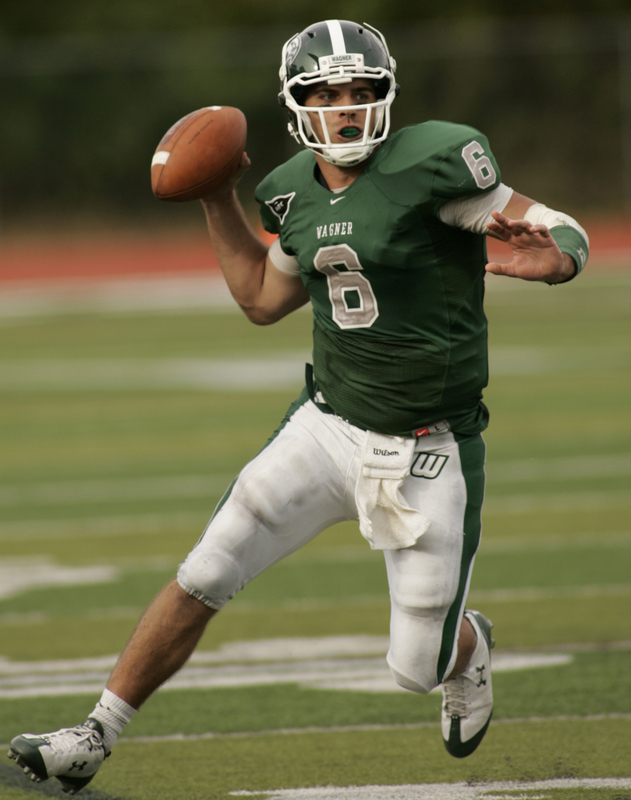 Wagner – Seahawk-spearheaded relief efforts were plentiful on Grymes Hill in the days after Superstorm Sandy hit. First, there is the overarching effort led by Wagner Cares (wagnercares.org). As a direct result of the devastation that has occurred this past week from Hurricane Sandy, the Wagner College community has united to provide relief efforts to the many victims using a student-inspired initiative known as Wagner Cares. Before Wagner College students began their return to campus, post-Hurricane Sandy, many became very interested in volunteering to help hurricane victims. At the same time, Gregory Balaes (’13), President of the Student Government Association, contacted President Guarasci with the Wagner Cares concept and website. Read more on Wagner Cares. Wagner’s women’s soccer team is making an effort to pitch in from the pitch. On December 1, the team will host a game day at Hameline Field, in which participating teams will be paired (by age and gender) against each other for one full match. Entry fees and raffle proceeds will benefit the victims of Sandy. Read more. The aforementioned Wagner football team has done its part as well. You can learn more about the team’s effort by reading the feature story “Bridgeton athletes at Wagner help Staten Island recover from damage from Sandy” and by watching the brief YouTube video below. With Wagner hosting and winning a FCS playoff game and Fairleigh Dickinson facing North Carolina with a spot in the NCAA Men’s Soccer Elite Eight on the line, Thanksgiving Weekend 2012 will certainly be a memorable one for NEC fans. There were also some happenings on the hardwood that undoubtedly left NEC loyalists with a warm, fuzzy feeling heading into this holiday season. 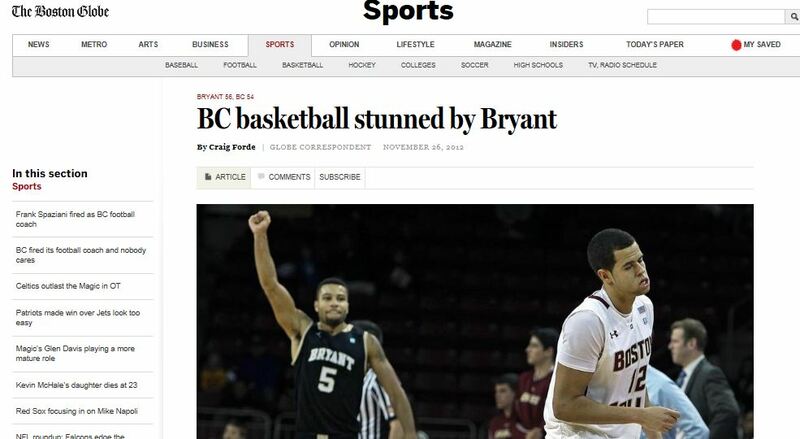 On the other hand, Boston College fans probably aren’t feeling the same way right now. The ACC member saw its men’s and women’s basketball teams suffer losses at the hands of NEC schools. At the Washing Dental Thanksgiving Tournament out in Seattle, Sacred Heart make Black Friday event darker for the Eagles. 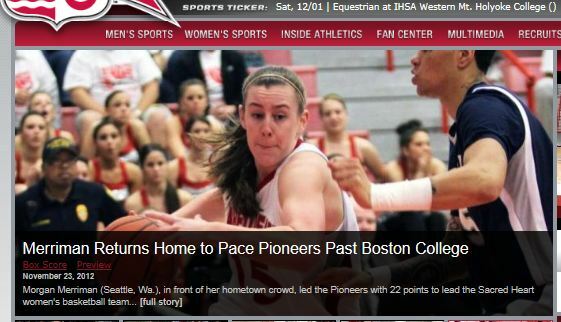 The defending NEC champion Pioneers topped BC, 54-48, behind Washington native Morgan Merriman’s 22 points. 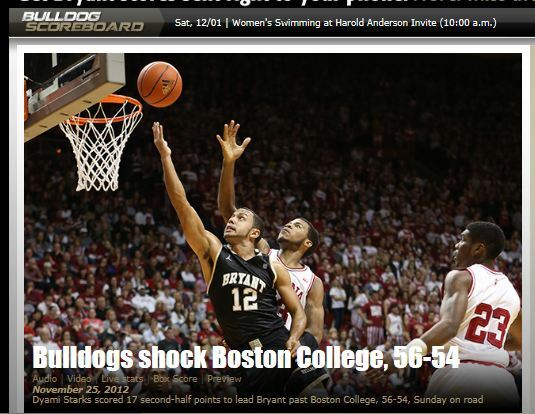 Fewer than 48 hours later, Bryant men’s basketball stormed Chestnut Hill and stunned the home crowd at Conte Forum. Bryant sophomore Dyami Starks scored 17 points in the 56-54 victory. Wagner’s road to Frisco will begin right on Grymes Hill against a fellow Empire State inhabitant. 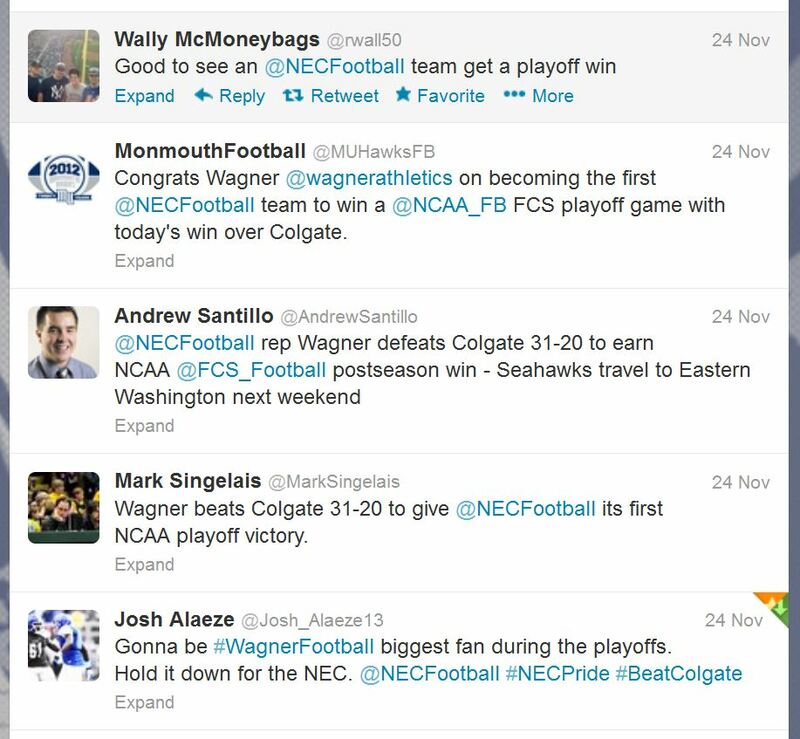 When the 2012 NCAA FCS playoff bracket was unveiled during a Selection Show on ESPNU, the NEC champion Seahawks learned they would be hosting Patriot League champion Colgate in a first round affair on Saturday, November 24. The game will air live on ESPN3. Fresh off its first-ever NEC title, Wagner (8-3, 7-1) is the lone first-time qualifier in the 20-team national championship field. The Seahawks clinched the NEC’s automatic bid when they outlasted Duquesne, 23-17, on Saturday, November 17. Albany (9-2, 7-1) earned a share of the title alongside Wagner, but the Seahawks held the head-to-head tiebreaker over the Danes thanks to a 30-0 Week 10 win in Albany. The Great Danes did not receive an at-large berth into the field and will see its season come to a close. The Danes, who have tied Robert Morris with a NEC-record sixth conference crown, had notable non-conference wins over Colgate and then-No. 23 Maine.